No. 5, Jalan USJ 1/31, 47600 USJ 1, Subang Jaya, Selangor, Malaysia. 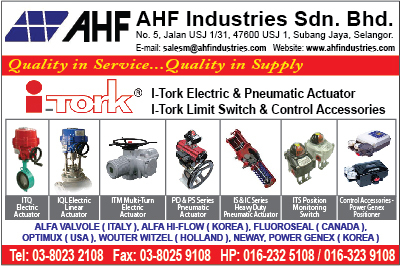 Since1987, AHF Industries has gained recognition as an established agent/ distributor of industrial & commercial suppliers of valves, valve automations & control solutions and is currently one of market leader in Singapore. AHF Industries is a full service multi-discipline organization for valves supplies, valve automation and control solution for Oil & Gas, Marine, Petrochemical and Pharmaceutical Industries. Most of our valves manufacturers have obtained ISO 9000/1, ISO 200, ISO 14001, API, TUV, ABS, LLOYD, BVQI, RWTUV,CE,KSB, VERITAS, NKK, UL/FM and etc certifications which complied to International Standard. Our Vision is to become world-class company in the Asia-Pacific Region for valves supplies, valve automation and control solution. Our mission is our commitment to provide excellent products and services to our customers in Asia-Pacific Region with Great Trust and Satisfaction in term of our services and products reliabilities.